St John Neumann Regional Catholic School exists to build a strong spiritual, academic and moral foundation that empowers our students to live lives of charity and service for the greater glory of God. At SJNRCS, it is our responsibility to ensure our students are fully prepared to become successful high school students and eventually be competitive in the global economy. Using technology has become an integral tool in helping our school fulfill this responsibility. We have an integrated 21st-century learning environment that provides a one-to-one student-device program in 5th through 8th grade and tablets in the lower grades. Fifth through eighth grade have 1:1 chrome books and utilize them in all classroom environments. Future expansion to lower grades in progress. Kindergarten through Fourth graders use surface tablets in order to facilitate tablet learning. Students learn in both Office and Google environments. Integration of google apps and docs is brought into everyday classroom learning. All grades have 1:1 desktops for weekly computer class and media class. Grades K-4 have an additional 1:1 computer lab for teacher directed projects. Kindergarten through eighth-grade has remote access to online research tools and various e-books to further their education from home. Our Science Lab has a smart board to visualize experiments. Fast Ethernet and WiFi is available for all faculty, students, and parents. 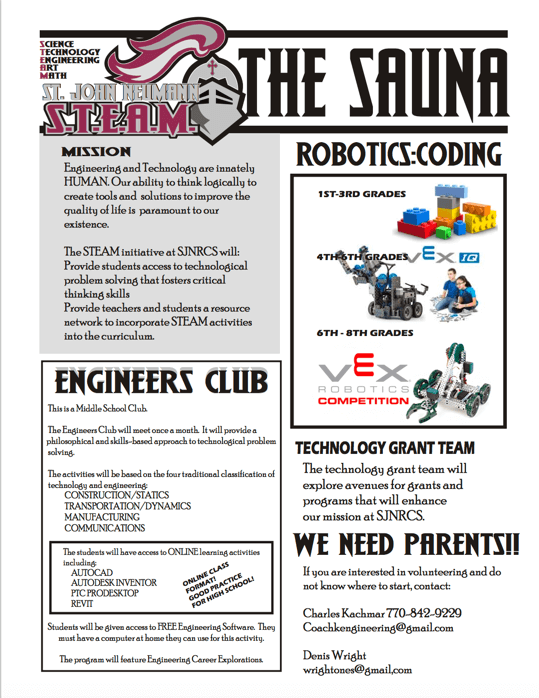 New STEM/ Robotics program for all grades! We envision a world where every student has the opportunity to be inspired by the excitement of hands-on STEM learning and knows the feeling of creating something with technology. We want people of all ages and backgrounds to recognize that creative problem solving is fun and see its importance in shaping a better future. Welcome to THE SAUNA – Social systems, Agentive algorithms, and Ubiquitous technologies accessed via Natural User Interactions. Sign up for Middle School STEM Robotics here…..